Odd. Scott Conroy who Erick Erickson badly misquoted in a September 23rd said it would be difficult but not impossible to get in the race. Oddly, CBS news re-ran this article with the headline, "Palin Waiting Game Could Run Into October." So Christie, who has also not announced and in fact has not been carried AT ALL on the 2012 GOP Nomination Chart (to my knowledge and experience) is not scrubbed but Palin is? But Palin’s aides insist that they have constructed a plan by which they could have a fully functional -- if tiny, by contemporary standards -- operation ready within a couple of weeks. The next item on Palin’s official agenda is a paid speech at a business conference in South Korea during the second week of October -- an event that overlaps with a GOP debate scheduled for Oct. 11 in Hanover, N.H. But in private conversations, aides to the former governor continue to suggest that there is still time for Palin to take advantage of her unique magnetism and ability to generate untold amounts of free media and small donations to run a volunteer-propelled, uber-grassroots campaign the likes of which modern American politics has never before seen. If she is still gauging the viability of a potential candidacy before making her ultimate decision, Palin might find grounds for encouragement in a McClatchy-Marist poll released earlier this week that showed her trailing President Obama by just five percentage points in a hypothetical general election matchup and beating him among independents. 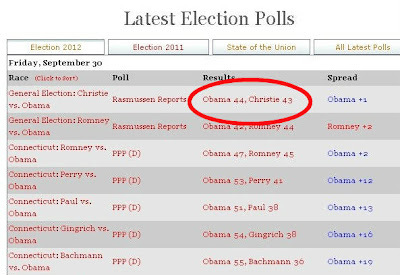 So why drop her and not Christie from current poll results? 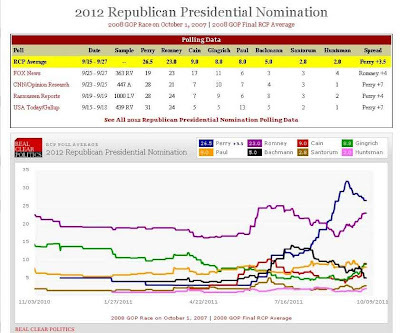 When I checked the running polls on Friday, I seem to recall Palin running at 9.5% on RCP. Cain's strong movement in the FOX poll was still heavily diluted by averages from pre-debate polls but had moved even in RCP to kind of a middle tier with Gingrich, Palin, and Paul. FOX of course shows the race essentially a 3-way race between Perry, Romney and Cain with Newt pressing hard to enter the fray. As I've said before, Perry jumped from single digits to a 15 point lead (8th place to 1st) when he announced. 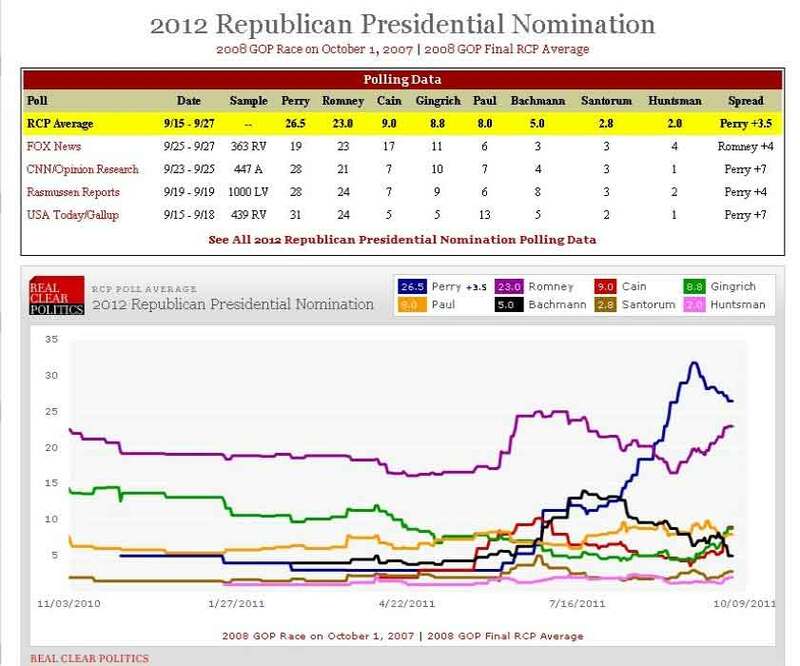 I have no doubt that Palin would jump from (effectively) 4th place to first if and when she announced. Of course, RCP has the right to do anything they like. 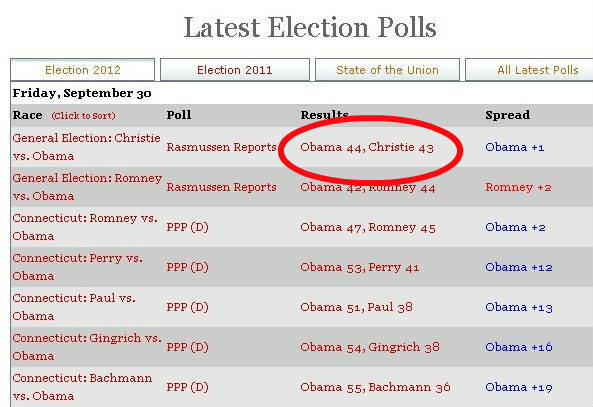 They obviously were not carrying either Giuliani or Christie in the Nomination poll but were Palin until this weekend which was incongruous except for the fact Palin was still polling third in nearly every poll. It might be a bit sobering to some Palin fans, but it certainly won't effect either her decision or interest in her should she announce by mid October or so.